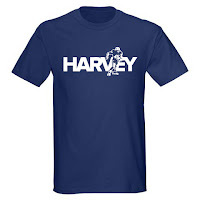 To get the word out about Frockly, we're going to give away a Harvey t-shirt this week. What's that? How do you qualify to win? Well, friend, it's easy. Just link to this blog post from your blog. Blogger users, click here: Blog This! I want to win Frockly's t-shirt giveawayThat's it. Link to this post and you'll be entered into the drawing. Using the magic of Blogger and Technorati, we'll see all the posts out there that link to this one and draw a random winner from all linking posts. Check back this Friday at 10am MST to see if you're the winner.